Obituary for Shirley A (Smith) Woolstenhulme | Crandall Funeral Home Inc.
Shirley Smith Woolstenhulme, 84, passed away at her home on October 21, 2018. She was born on January 25, 1934 in Coalville, Utah to James William and Fawn (Williams) Smith. On July 10, 1954 she married Keith Hortin Woolstenhulme in Wanship, Utah. He preceded her in death on December 15, 2003. She was a lifelong member of the Oakley Civic Club. Shirley volunteered for 50 years taking charge of the “hamburger shack” for the 4th of July Oakley celebration. She enjoyed every minute of it and was known as the “Shack Queen”. 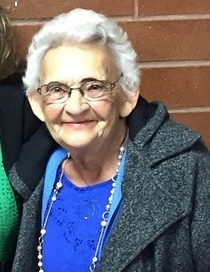 She is survived by her children, Lorrie Jean Hoggan; Michael Keith (Sue) Woolstenhulme; James Elmo (Stephanie) Woolstenhulme; and Bryan S. (Pam) Woolstenhulme; her brother: James Kent (Judy) Smith ; 15 Grandchildren and 25 Great-Grandchildren. She is preceded in death by her beloved husband, Keith Hortin Woolstenhulme; beloved granddaughter, Sarah Lyn Woolstenhulme; beloved sister, Joan Smith Shaw; and her beloved parents James William and Fawn Smith. Special thanks to the kind and loving care given to our mother by the hospice professionals. Immediate family will greet relatives and friends for a celebration of life visitation at the Oakley North Bench LDS Ward Chapel from 10:00 AM to 11:30 AM. Following the graveside service, friends and relatives are invited back to the Red Barn to share memories and hamburger shack hamburgers.